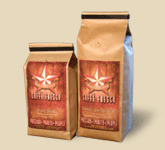 Black Hand Blend is reminiscent of the hills of Sicily. A land where evening breezes are charged with fragrances from citrus trees. A place where kitchens are filled with aromas of wine and tables are adorned with nuts and figs. Contents of this blend are Secret—reminiscent of the Black Hand.